I know, per the Los Angeles Sheriff Department’s Prison Radicalization unit, that many imams in LA have been tremendously helpful to law enforcement in rooting out radicalization efforts in LA. I have no reason to doubt that; I’m sure there are many like Imam Rahman in the prison system. But the continued existence of P-Rad units in New York and LA speaks volumes about the difficulty prisons face in finding qualified, moderate imams — as well as the consequences of failing to find them. “Prislam” has a long reach. Though your typical Prislam-devotee will usually identify as Sunni or Shiite, it’s rare that the impassioned convert will actually get the identification correct. There are those who identify as Shiite who will roll their pants like the Sunni al-Qaeda. There are self-identified Shiites who will rub their foreheads vigorously on the ground into a prayer bump, even though Middle Eastern Shiites use smooth stones on their foreheads to avoid touching the ground. In a crowd of supposed Shiite Prislamists, it’s again not uncommon to find one sporting boots in the militant Sunni tradition. And regardless of sect, they all seem keen on tattooing bastardized Arabic phrases (it’s hard to find a jailhouse tattoo artist who knows Arabic) on themselves, which, technically, is a violation of Islam’s mandate to keep one’s body clean and unspoiled. But, of course, none of that matters when the cause is worthy. And Prislam, regardless of its Shiite, Sunni or American affiliation, makes a strong case for its worthiness. As Peter Neumann and Brooke Rogers put it in their report on radicalization, Islam has become “the religion of the oppressed – what Marxism was once in Europe.” To that end, Prislam recruits heavily among black inmates because it exploits their antipathy towards law enforcement and feelings of oppression under American law. Gradually, Prislam can nudge inmates into outright hatred for America. 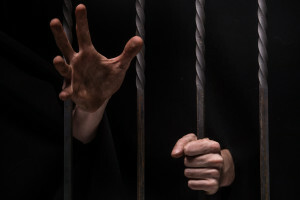 But more than “conversion,” black inmates are often susceptible to “reversion.” As in, “your name is not your name, but your slave owner’s name.” So, as logic follows, “your religion (Christianity) is not your religion, but your slave owner’s religion.” By adopting an Islamic name “you are returning to your original practice of Islam.” And if you think it’s kind of ludicrous to believe that Islam was the predominate religion in Africa from 1607 through 1863, Prislam likes to argue that, actually, everyone is born into a state of submission to Allah. Prislam doesn’t just focus on black inmates. Prislam also uses Hispanics’ cultural proclivity towards organized religion against them. “You’re at your best on Sundays,” the pitch begins. “You go to church, see the priest, he forgives your sins. On Sundays, you’re exactly the son your mother loves. But what happens? Monday you get tempted. Tuesday, you get drunk. Wednesday, you knock over a liquor store. By Saturday you don’t feel like the angel you were last Sunday. And by the time the next Sunday rolls around, you have a whole new set of sins to confess. But in Islam, we pray five times a day. You are never apart from Allah. You always have a chance to atone. We are the most devout religion. We will keep you close to Allah five times every day. You can’t fail.” This actually works. Prislam attracts people because as long as you can find some Koranic excuse, everything is justified. Rob gas stations to get money for a terror attack? Gift yourself methamphetamines or Xanax to better perform a suicide bombing? Visit hookers to blow off steam after a good day converting people? You don’t have to change a thing. Just do everything you did before in the name of Allah. Our abilities to vet prison imams and monitor prison radicalization efforts require both savvy effort and political will. We need to ask ourselves if closing Guantanamo Bay and moving the prisoners into American prisons won’t simply be like throwing a lit match into the tinderbox of our prison system. America’s prisons are the perfect shadow to hide a growing fifth column of potential terrorists. Our enemies have even told us so. We’d do well to believe them. This article first appeared in The Havok Journal on 26 November 2016.